Lagosians, are you ready to be Maltavated? 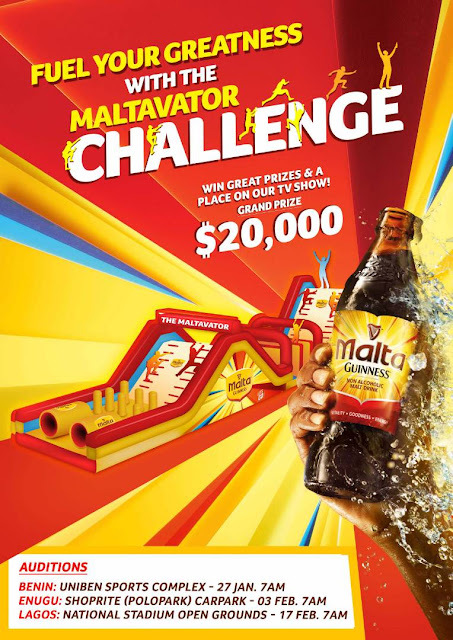 The new exciting Malta Guinness Maltavator Challenge train arrives in Lagos this weekend! Are you strong? Are you smart? Do you think you have what it takes to be part of this physical and mentally tasking challenge? Then come to National Stadium, Surulere, on the 17th of February 2018 to audition for a chance to be part of this exciting and energizing challenge. Registration to participate in this challenge is absolutely free and Contestants are expected to arrive at the venue to commence registration by 7am. First 200 early birds will get special goody bags! Come prepared because Malta Guinness will be on ground to fuel your can-do spirits to greatness with the goodness of Malta Guinness filled with energy-giving vitamins B1, B2, B3 and B6. The best Maltavators from Lagos will join others from Enugu and Benin to compete for final slots to represent Nigeria in the Pan African TV show. 0 Response to "2 days to go! Lagos are you ready for the Maltavator Challenge"